As Antonio EC2AG said, today was a 1st class day for sotting at the Basque Country. After a couple of weeks in which we have had only rainy and windy days, today we have not only enjoyed a truly summer day, with abt 20 deg. C. and sun, but also some beautiful experiences. First of all, Marcial EA2BDS, Oier, my 9 y.o. 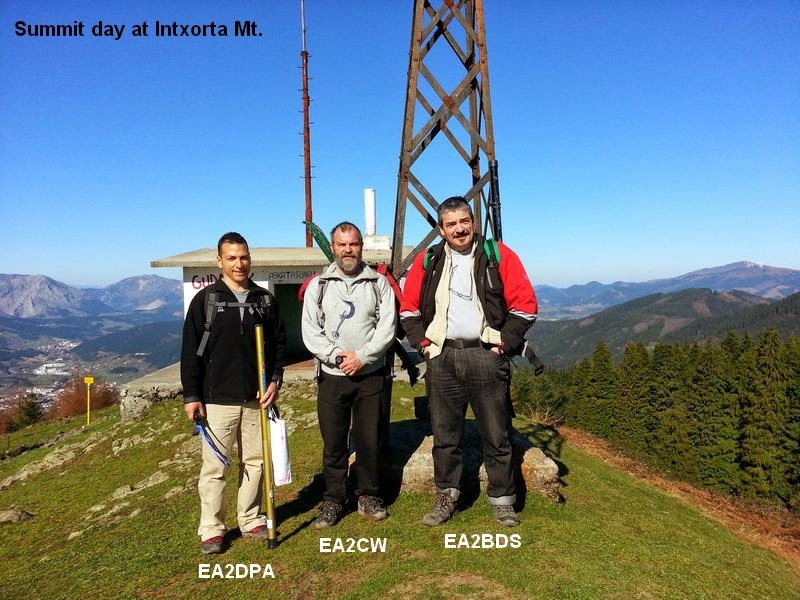 boy (no callsign yet) and me, were joint by Raul EA2DPA, for his first SOTA activation after more than one year "activator holidays". So we were able to cover 3 bands at the same time, mostly 10, 14 and 24 mhz. We've had place enough to mount 3 full size dipoles, running 3 CW HF rigs as well. The landscape was amazing too, with more than 10 sota summits at sight under the noon light. Secondly, I was using by the first time my new 2nd hand FT-857 and LiFePO4 8ah batteries (1st hand) and they both have performed very well. Anboto EA2/BI-002 and Mugarra EA2/BI-013. 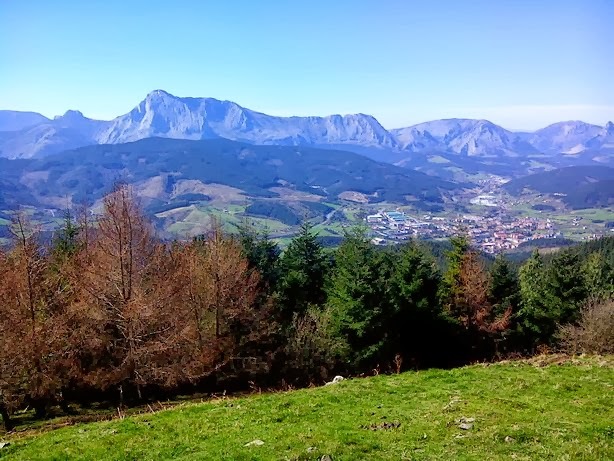 Such a beautiful landscape from Intxorta! At the summit we have got the visit of a group of children from a near ikastola (basque school), more than ... well they moved too fast to count them... but a lot of! Belong theier parents was Roberto EA2AF, from Elgoibar (EA2/SS) and he was carrying a 144mhz talkie, so, after a short chatting, we "compelled" him to use his equipment to activate the summit too... "I have no paper,... no writting machine,.." excuses were fast avoided and we made him ready to the action. So he hadn't any chance, and made his work!. Despite the large number of small people running thru the summit, they didn't "hurt" our preciate dipoles. Even more, I had a group on my side, listening quite serious and interested while I was making CW QSO's on 10Mhz. Later came some explanations (where is your keyer? not this even saw blades you are using? In which language do you all speak while CWing? How do you know which country are the people from) and a hundred more questions. Finally, and even with all this entertainment, I has been able to make 89 QSOs, 11 of them S2S, reaching 2K chaser points, and 330 S2S points to become at the first place at all EA CW S2S. So I can properly say that today has been a good SOTA day for all of us, but specially for me! Thank you very much to all the people (a lot of them!) hiking the summits as to all the sloths enjoying the day from home and keeping a short time to "make my day" (as Clint Eastwood said).